We have amazing offers for new leaner drivers with Book Learn Pass. If it's your first time booking a driving lesson with us, you can benefit from our new customer discount worth up to £30 when you block book 10 or more driving lessons. We are sure you will love your teaching and learning to drive with one of our Stratford based driving instructors. With some of the best prices for driivng lessons in and around Stratford, we offer some of the cheapest prices in all of Newham. 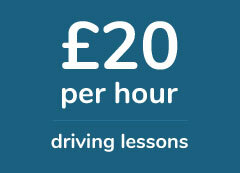 We aim to keep our prices low to ensure you complete your driivng lessons on time and on budget. Prices for current students start from £24 per hour and students who block book their driving lessons in advance are also eligible for discount too. If you urgently need to pass your driving test, book a crash driving course in Stratford today. On this course, one of our experienced driving instructors in Stratford, will help you complete the driving syllabus in a matter of weeks. These intensive driving courses are great for new learners and experience drivers alike. Welcome to Book Learn Pass, the number one website for driving lessons in Stratford. As one of the best driving schools in East London, we can help you pass your driving test in a short period of time. Our driving instructors in Stratford are experienced and we have various driving courses to suit all needs and budgets. With competitive prices and everything from automatic driving lessons to intensive driving courses, Book Learn Pass is rated one of the best driving schools in the Stratford area. We have a number of ways you can book driving lessons with us. You can give us a call on 07597471607. Our phone lines are open from 8:00am to 9:00pm, Monday to Sunday and our customer service team will be happy to assist you. Give us a call at a time of your convenience and your driving lessons will be booked in no time at all. If you would like us to call you, fill in the contact form and we’ll call you back right away. Our customer service team is on hand 7 days a week and once we have your details, we’ll schedule a call within a few minutes. For those who prefer to communicate by email, you can book driving lessons in Stratford through our email booking service. Simply send an email to bookings@booklearnpass.co.uk with the type of driving lessons you are interested and your location and a member of our booking team will respond with a range of time slots and our driving instructor’s availability. Whether you prefer paying in cash or paying by card, we have several payment options available. Your driving instructor will have a mobile chip and pin reader allowing him or her to take card payment at the start of your lesson. You can also pay by cash or bank transfer if you prefer any of those two options. If you would like to pay for your driving lessons online, you also have the option of paying via Paypal. East Village: Famous for being the home of the 2012 Olympic Village, East Village is one of the most sought after areas in Stratford. With great transport links and Westfield shopping centre on its doorstep, it’s fast becoming one of East London’s most desirable areas to live in. If you are based in or close to East Village, one of our driving instructors will be able to pick you up and drop you off at a time of your convenience. For more information on Stratford’s East Village, you can visit their website. Chobham Manor: Located in close proximity to Startford International rail station, Chobham Manor is the first of five new neighbourhoods on Queen Elizabeth Olympic Park in Stratford. It has been built to provide a mixture of private and social housing and any learner drivers living within the area can book driving lessons in Startford with Book Learn Pass. For more information on Chobham Manor click here. Church Street: A residential hub located in the middle of Stratford, Church Street is home to a diverse group of residents. With a mix of social housing and new build apartments, it’s a melting pot of different cultures and learner drivers living within its vicinity, can book driving lessons online today. Stratford is located in the London borough of Newham. It borders Hackney to the west and Plaistow to the east and it’s home to the largest shopping centre in all of Europe. Aside from Canary Wharf, the 2011 completed flagship Westfield shopping centre has made Stratford East London’s most prominent place of business. Along with the Olympic Village, the new shopping centre has led regeneration in the area, sending houses prices rising by over 70% in the area. As of 2016 the median age in Newham was 30.8 years. Can I book driving lessons in Stratford as a gift? Yes you can purchase driving lessons as a gift for a friend or family member. To do so either call us on 07597471607 or send an email to bookings@booklearnpass.co.uk stating the number of lessons you would like to book and the intended recipient. Once payment is confirmed, you will receive a voucher by email which can be redeemed by the by the individual for the number of hours purchased. If I pass and still have lessons outstanding can I get a refund? If you pay in advance for your driving lessons and you pass your driving test with lessons outstanding, we will issue you a refund for any lessons not taken. You can reschedule your driving lessons free of charge, up to 48hrs before the start of your lesson. If you can cancel or rescedule within 48 hours of your lessons’ start time, you will be changed the cost of your session. Can I choose what I work on during my driving lesson? Generally speaking, your driving instructor will create a lesson plan for you to follow, to ensure you learn to drive safely and get your driving license in the shortest possible time. If however there are specific areas you wish to work on, please let your driving instructor know and they will incorporate these into your lesson.